As the economy continues to firm, expect a rebound in M&A due to lower valuations in combination with a lower cost of borrowing as the sector comes from a (6) six year low in terms of volume. Approximately 610 deals have been announced so far with a total par value of over $75B, giving 2010 a very robust start. The consensus is that M&A volume will most likely exceed $3T in 2010, with approximately $1t in European volume. As the economy continues to firm, expect a rebound in M&A due to lower valuations in combination with a lower cost of borrowing as the sector comes from a (6) six year low in terms of volume. Approximately 610 deals have been announced so far with a total par value of over $75B, giving 2010 a very robust start. The consensus is that M&A volume will most likely exceed $3T in 2010, with approximately $1t in European volume. This will be augmented by IPO market activity and strategic acquisitions by corporations increasing efficiencies and marketshare. Given the low cost of borrowing, albeit it with dramatically reduced leverage–in combination with the number of cash-chocked corporations with no areas left to cut costs lining up as potential strategic buyers–transactions will be up considerably from previous levels as the stage has been set for a return to record volumes. Mergers and Acquisitions are important to various parts of finance. In terms of of publicly traded firms, M&A deals are highly important to not only the corporations but a number of hedge funds in regards to their respective merger arbitrage strategies, look for a return to 2004 levels due to the factors stated earlier. M&A is also very important to investment banks because roughly 3% of the acquisition results in deal fees generated by the bank as opposed to 5% for IPO stock flotations, these fees drive the profitability of investment banks and the financial services sector. From a practical perspective, price dislocation will drive deal earn outs and foster continued cooperation between lenders and sponsors to work collaboratively, which will also drive transaction volume. Expect private equity firms to sell as corporations take the lead in purchase activity. Corporate boards and institutional investors will grow in power during this period as they will decide which situations they will allow corporate chieftains to pursue to increase shareholder value. In short, there won’t be any blank checkbooks as the Oracle from Omaha tried to outline as he withheld his support for Kraft-Cadbury, saying that he needed to know how they were going to pay for the deal. Imagine that. From a historical perspective, M&A expanded greatly after the dismantling of Glass-Steagall which set the stage for banks to take center stage driving transactions. Due to the banks strong balance sheet, they gained an edge in acquisitions. This edge later shifted to private equity firms as they began to complete the lion’s share of transactions due to the massive amounts of cheap leverage available. In the future, the next wave will be one of participation and involve the coordination of equals between private equity, corporations and M&A bankers due to price dislocation and condensed credit capacity. As the volume increases, investment grade bond issuance will undoubtedly increase as much as 8%, with high yield and bank loans increasing as much as 10%-15% within the 3rd quarter due to banks to increasing lending for hard assets due to a rise in the strength of manufacturing. Look for sovereign funds and institutional investors to accelerate the flow of acquisitions with a ready flow of approximately $5 trillion in assets poised and ready to enter this sector. Additional signs pointing to a robust return in volume are the rate of corporate bond issuance, which was up nearly 50% due to improving economic conditions and scarcity of other potential investments effectively serving to drive the market forward. Leveraged loan volume in January was roughly $9B, approximately 24% of the entire volume of activity in 2009 which was $38.8B–making it single-handedly the largest monthly volume since the onslaught of the credit crisis. The values pre-Lehman Brothers dissolution were markedly higher and peaked at $500B in 2007. The single largest driver will be core acquisitions from focused buyers as stated earlier. In 2009 the bulk of the activity was in the health and auto sectors, look for 2010 acquisition activity to be multi-sector due to the main driver of the transactions being strategic acquirers increasing efficiencies and marketshare. However, both healthcare and technology will be particularly hot areas. Transactions in general will be done with considerably less leverage. The sponsors will be willing to pony up the 30% to 50% equity with leverage from 3 to 8 (depending on the sponsor)–these terms are dramatically different than the 12% equity and 15x leverage metrics previously used. Due to the greatly reduced leverage, do not expect a hearty return of LBO’s for at least 10 to 12 months. In regards to international M&A, global buy out activity was down nearly 67% to $72B as the sector had continued to decline in 2009. In previous years the U.K. was much more lax in terms of acquisitions by foreign multi-nationals, expect a tightening of policy to occur in this area–protectionism will be the norm in a globally coordinated eased world. Lately, we have seen an increase in emerging countries participation due to sovereign wealth funds and strategic opportunities within their countries which maximize cross border deals with other firms for effective knowledge transfer. Expect this trend to increase and comprise almost 20% of Global M&A going forward. Emerging market activity is up over 170%–and this will continue in the new global opportunity focused world. Raj Gupta is the former Chief executive officer and president of the Fortune 500 company Rohm and Haas. Rohm and Haas was acquired by Dow Chemical on August 1, 2009. Gupta graduated in 1967 with a degree in mechanical engineering from Indian Institute of Technology.Gupta continued his studies going on to earn an M.S. degree in Operations Research in 1969 from Cornell University, and his M.B.A. in Finance from the Bennett S. LeBow College of Business at Drexel University in 1972.In 1971 Gupta joined Rohm and Haas as a financial analyst. Working his way up through the company Gupta was elected CEO and chairman of Rohm and Haas in 1999, and in 2005 became president. On April 29, 2005 the US Pan Asian American Chamber of Commerce named Gupta as one of the top 10 Most Influential Asian Americans in Business.In 2006 Gupta was named Drexel’s 53rd Business Leader of the Year. Gupta has also served as the chairman for the American Chemistry Council and the Society of Chemical Industry, America Section. Raj completed one of the largest corporate transactions ($18.8B) with Dow Chemical in a very difficult time against considerable odds–he is both genius and legend. Mr. Gupta is the immediate past Chairman of the American Chemistry Council, and the Society of Chemical Industry, America Section. He sits on the board of trustees for Drexel University. He is a member of the boards of Tyco, The Vanguard Group, the American Chemistry Council, and the Chemical Heritage Foundation. 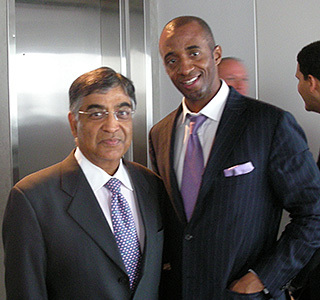 Mr. Gupta has been elected, effective January 2009, to the Board of Directors of Hewlett-Packard Company.